It is Christmas in November at the Chilebrown household. A brand new 14.5 Weber Smokey Mountain Cooker was delivered to our doorstep by the UPS man. I do feel like a kid on Christmas day. I have that tingling nostalgic like feeling that comes from opening and playing with that new toy. 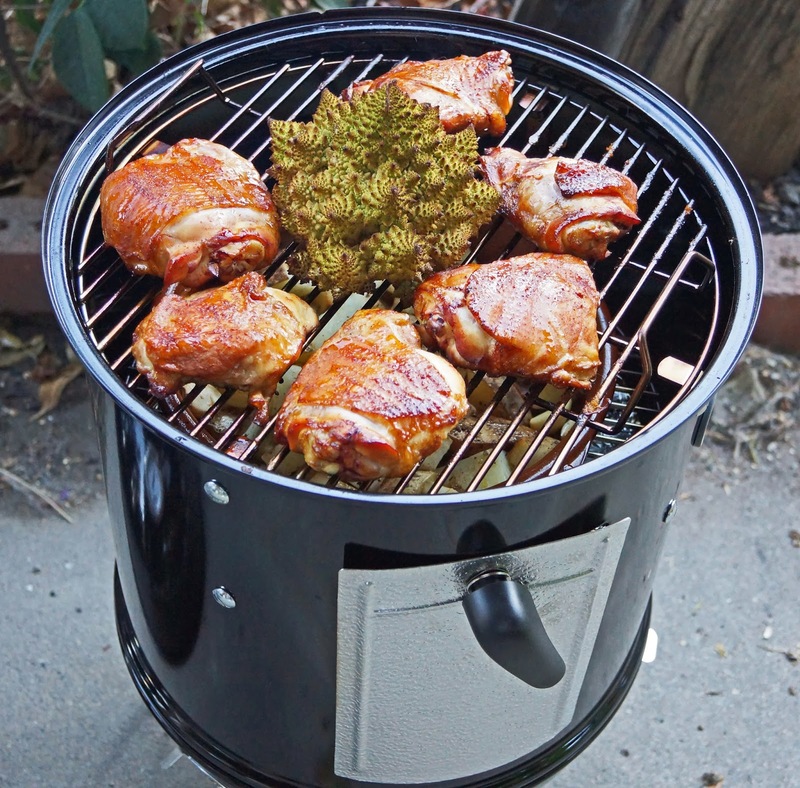 This is no toy but the newest model of a smoker created by the Weber corporation. 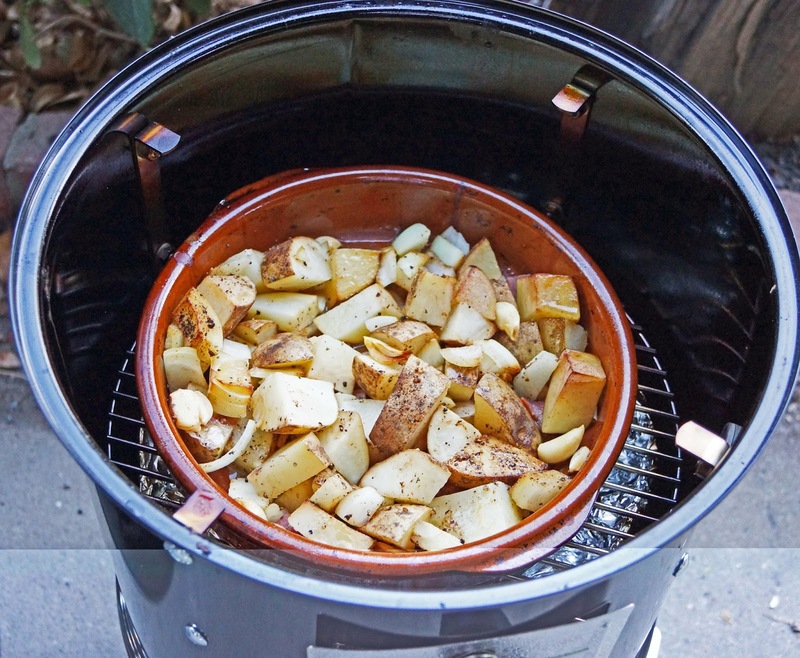 The Smokey Mountain Cooker is a popular smoker that is used by competitors and serious backyard cookers. They come in various sizes and this 14.5 inch grate size is the smallest. The smaller size makes is portable and will use less fuel (charcoal) than the larger models. This 2014 model was only released weeks ago and I was one of the first in line to purchase one. Let's unwrap this barbeque and get cookin. This new model has some nice new features. There is a built in thermometer to monitor proper cooking temperatures. There is a nice portal located on the side to insert thermometer probes. The image with the chair shows my thermometer which is monitoring the internal temperature of the pork roast. There is a metal shield on the bottom of the cooker for heat efficiency. Other wise this is the same cooker as its bigger brothers. This model is the perfect size to cook smaller amounts of food with less fuel. We built an initial fire to set the paint and burn off any possible contaminants. Our second fire would cook some chicken and Romanesco cauliflower. We also had a casserole of potatoes, onions and bacon positioned underneath our chicken to be smoked and capture the dripping chicken love. We used some peach wood for our smoke. We only needed two full chimneys of charcoal and two cubes of smoking wood. Our little cooker worked like a charm. It bellowed out plumes of smoke. It was the little engine that could sitting next to its larger brothers. Our cooking time was an hour and one half. We were rewarded with tender, juicy smoked chicken. What a treat! A prime pork roast from U.C. 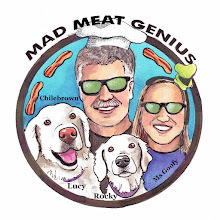 Davis Meat Labs was our next cook. Hickory wood was our flavor tonight. Once again our new cooker did its magic. 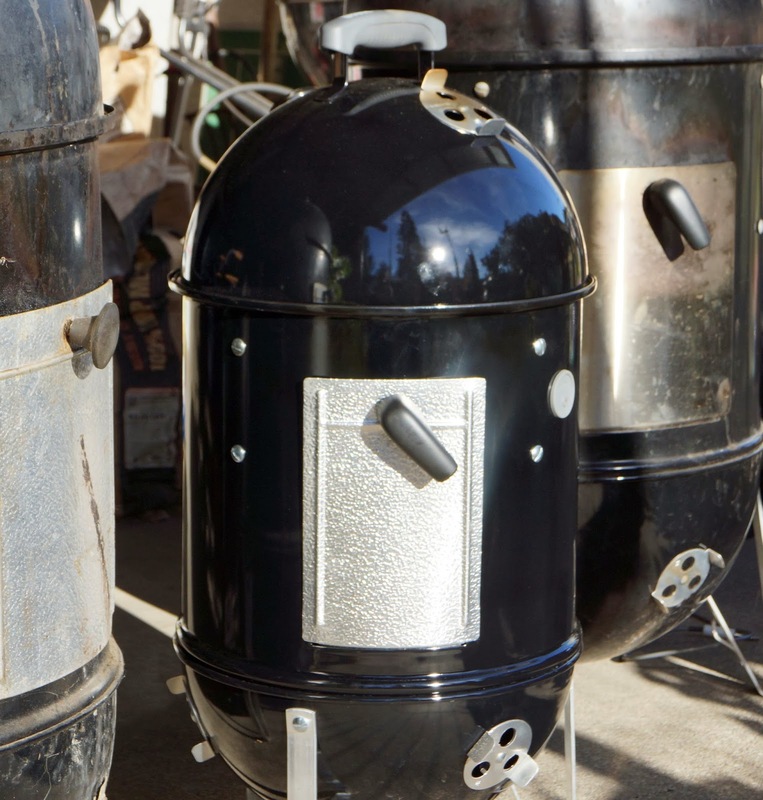 We are proud to announce a new addition to the Chilebrown arsenal of smokers. What should we cook next? Big Dude, This weekend we are going to cook a pork shoulder. Pulled pork sandwiches are Ms. Goofy's favorite. Wow, just looking at that pork roast makes my mouth water! Looking forward to hearing more about this smoker. I'm interested - how long did it take to cook the chicken? And did the chicken drippings do a good job on the spuds? Zoomie, I mentioned the cooking time but I will refresh your memory with an hour and one half. And Yes!!!! I love breaking in new toys. Congrats on your new baby. Three Dogs BBQ, Shoulder is next. Brisket would have to be rolled or cut in half I guess. Any suggestions? 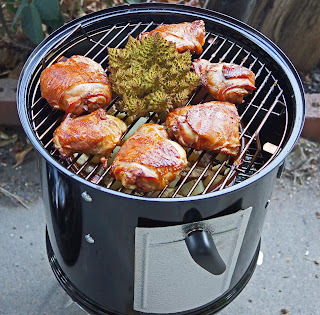 I still want to make my own mini WSM even though they are available now. I saw that Harry Soo was cooking a whole comp on one, or maybe several. Wow! I didn't know they brought these back. 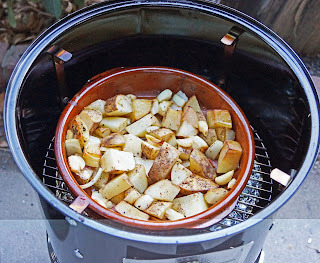 I made a do it yourself one using the tamale pot and smokey joe combo and it works great except for really cold weather. The aluminum tamale pot center just loses too much heat in sub 30 degree weather. These are a great size. 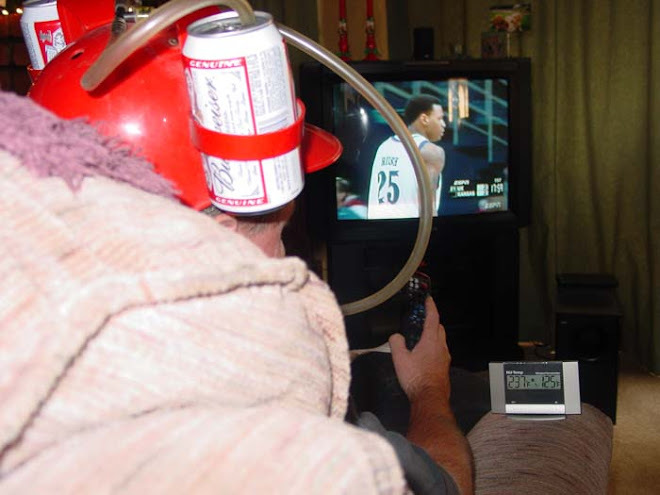 Your bigger smokers will have a lot of time off. I may get the 23.5 and then I can hide the 14.5 inside it .... heh! Greg, I need to talk Ms.Goofy into getting the 22.5. Then I will have a complete set. I love the look of this little beauty... how much could you get in this little one, I'm looking to get my first dedicated smoker and can't decide on this or the middle sized 18.5... not sure which way to go! ?